In case you didn’t pop over to Sweet Domesticity last week to read the Spy Garden guest post, I’m posting it here. Enjoy! 1. Don’t be afraid of killing plants. For each of the plants thriving in Spy Garden, two (or maybe more) are looking down from plant heaven. Cutworms have eaten my cauliflower plants, flea beetles have gnawed up my eggplants. 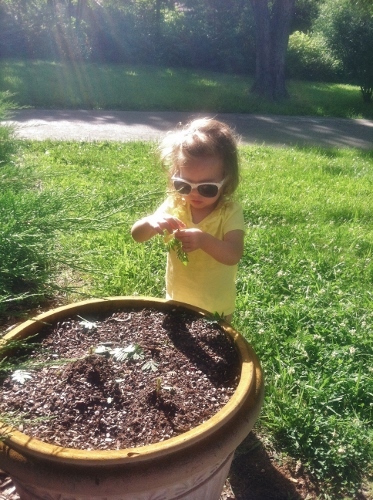 All the marigolds planted in two large planters have been destroyed by my two year old “Babyzilla”. I tried growing three different varieties of eggplants in 2013: started the seedlings indoors in February, with nary an eggplant in sight by October. Does this mean I will never try growing cauliflower or eggplants again? No! Don’t get too frustrated when you kill plants. 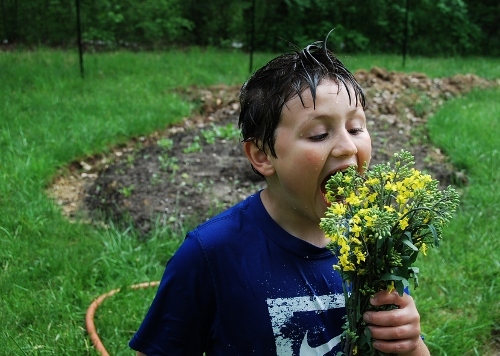 And if you are gardening with kids, don’t get mad at them when they (perhaps more swiftly) kill your plants. 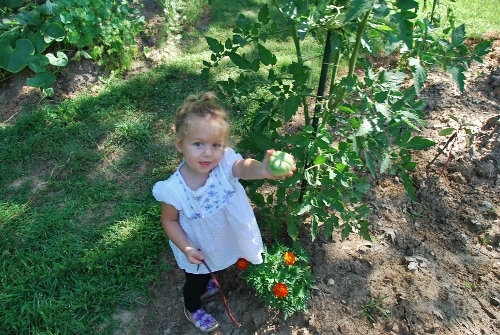 Encourage them to pick the red tomatoes (vs. the green ones) and to be gentle in the garden. But, if they rip a bean plant out of the ground, let it go. I mean, I wouldn’t encourage pure destruction, but a broken stem or some torn leaves are small sacrifices in cultivating (pun intended) a love of plants. 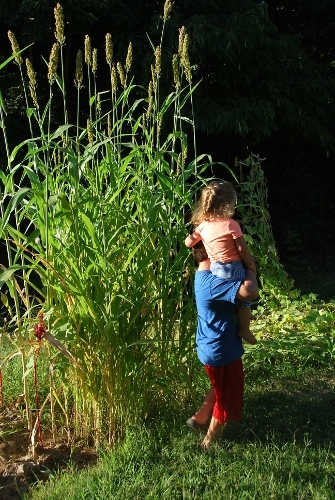 Even growing just a few plants provides valuable lessons for children of all ages. My kind of math lesson! 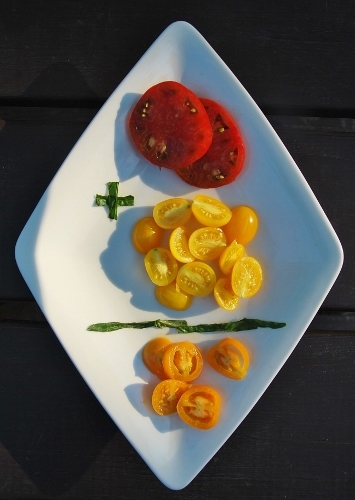 How long does it take from seed to plate? What types of animals live in the dirt? What do birds (or deer!) like to eat? …will naturally be investigated when you’re in the garden. Even when you are not actively “teaching”, kids will observe thousands of aspects of your local ecosystem and truly learn about “real” food. Not to mention that, in my experience, kids are about 300 times more likely to be adventurous eaters when they have a hand in growing it. 3. Grow the things that you can’t kill. Asparagus and strawberries are very low maintenance perennials. Mint, catnip, thyme (and most herbs) are great choices. Even if you don’t use the herbs you grow (and I definitely confess on this point that I don’t harvest and use my herbs nearly as much as I should) having something green and thriving in your garden will get you more excited about gardening. Most kids love mint. So it’s not about whether or not you really like mint in cooking. Just grow mint, because it will grow. It is always one of the first green things in our garden and therefore a staple snack in early spring garden walks with the kids. 4. In addition to growing “things you can’t kill” also try growing lots of different things (as much as you have room for). 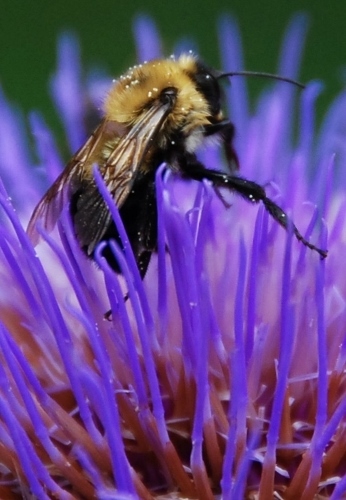 Squash may be devoured by squash bugs one year that your tomatoes are beefy and prolific. Beans may be doing awesome when your lettuce is burnt to a crisp. 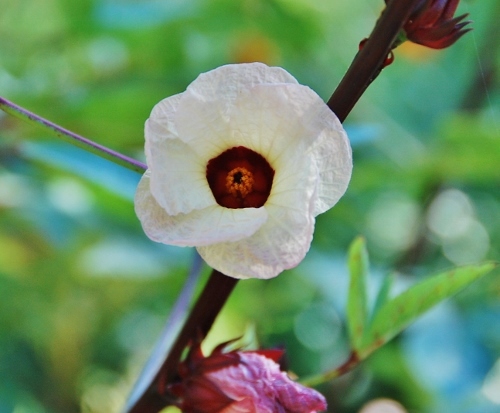 Even though starting plants from seeds is a bit more work, it is a LOT cheaper, and if you are following rule #1, you don’t want your sacrifices to be expensive exotic specimens from a designer nursery. Plus with seeds you get a ton more plants (and because of the law of attrition (#1!) this is a great thing! I always encourage the kids to choose the things we grow. My eight year old son said, “lemon cucumbers”. My favorite were the “Violet de Provence artichokes” The spy gobbled down the prepared hearts (without ANY salt/pepper/lemon/etc: they were delectable!) But the ones that we left to “go to flower” were so beautiful and striking and added a lot of whimsy and magic to the garden, which makes it inviting to children. 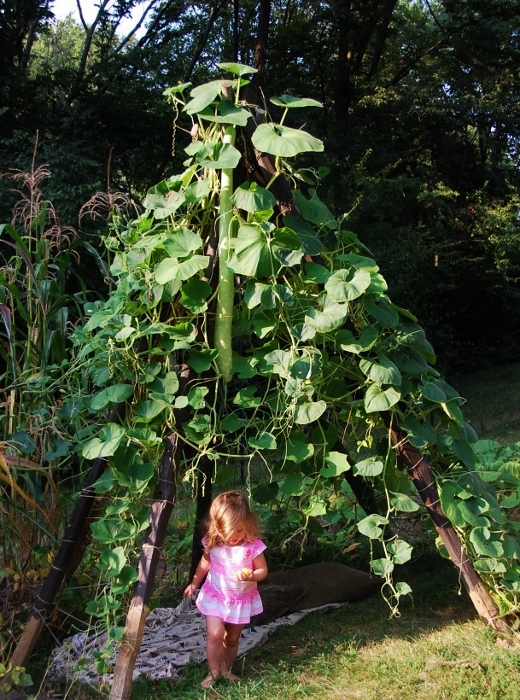 Nasturtiums are also a great choice for kids because the flowers and leaves are edible. 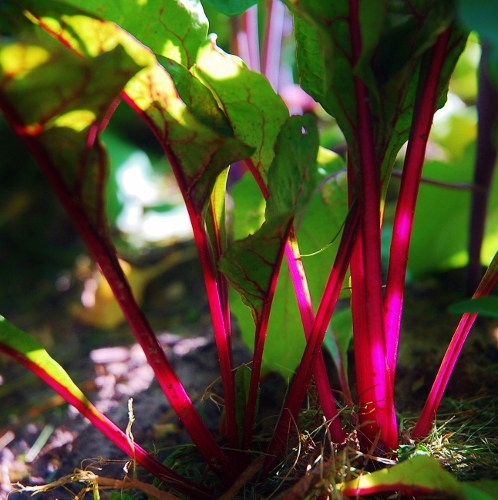 And on that point, I try and ONLY have edibles in the garden (since the baby grew accustomed to sampling everything, I wanted to make sure there was nothing poisonous in the garden (i.e. moonflowers, morning glories). Planning for the spring garden starts now! So if you’ve ever toyed with the idea of growing something but convinced yourself you have a black thumb, just remember rule number one! 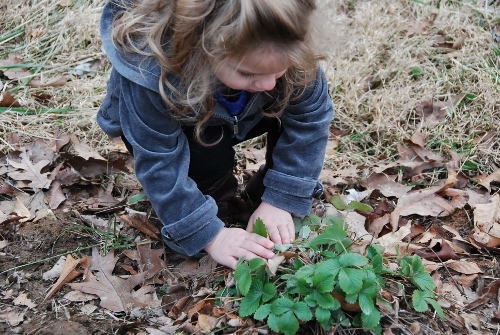 This entry was posted in Creativity, DIY, Food, Garden, Gardening, Parenting, Photography, Uncategorized and tagged Children's Vegetable Garden, Gardening with kids, Tips for Gardening with Kids on February 20, 2014 by Spy Garden. OY!! I know! I think this heretofore shall be the Week of Spy Garden Blogging Block. Third week of February. Mark it on your calendar for next year. Dead grass, cold dirt, winter sky. I think I need some spring buds to get me clicking the camera again. A few days ago on a garden walk I took 30+ pictures and ended up just deleting ALL of them hahah dirt, straw colored grass, sky. Groundhog day.